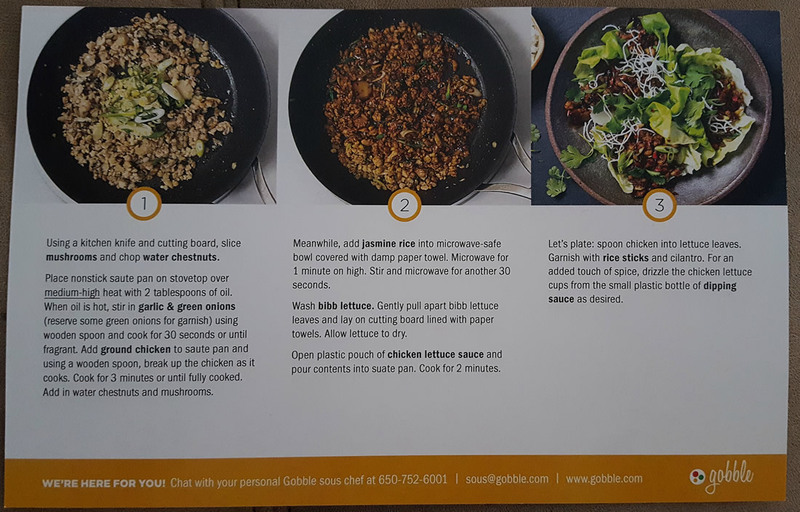 Gobble offers chef-inspired recipes that can be completed in 10 minutes and using just one pan. Their goal is to make life simple. 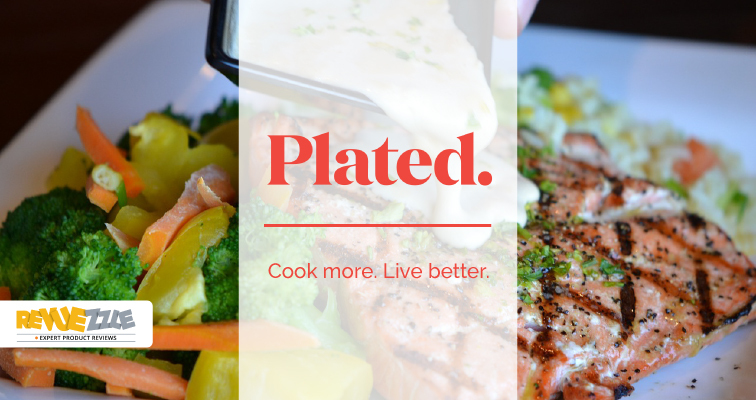 They do the meal planning, shopping, prep and all you do is cook. 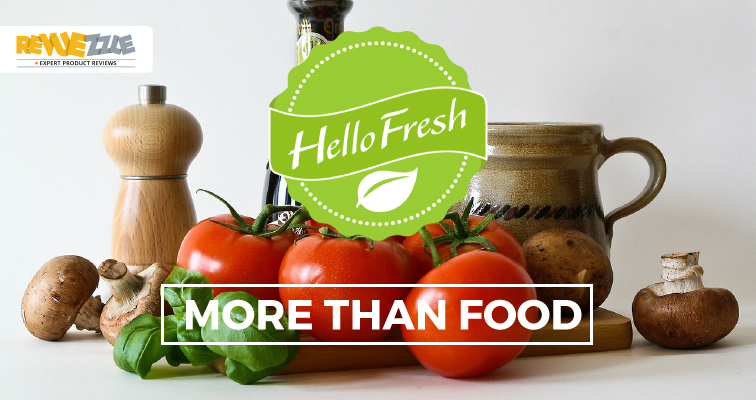 While they offer a higher per price serving, they are all about convenience – and convenience comes with a price. 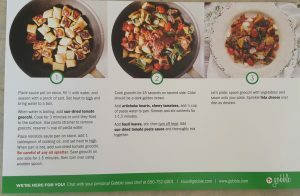 For the price, you may wonder what Gobble’s recipes and food tastes like – and we don’t blame you. 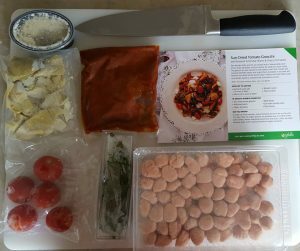 That is why I ordered myself a Gobble box and scrutinized and tasted a week’s worth of recipes (which by the way is just three meals). Gnocchi is served like pasta, but the “pasta” you are eating is actually ground up potato – and it is delicious. I was extremely excited to try out the Sun Dried Tomato Gnocchi from Gobble because I’m a big fan of gnocchi. It’s soft, yet has a crunch when you pan fry it, it absorbs sauce perfectly and you don’t need a hefty plate – a ¼ cup is big enough of a serving trust me. 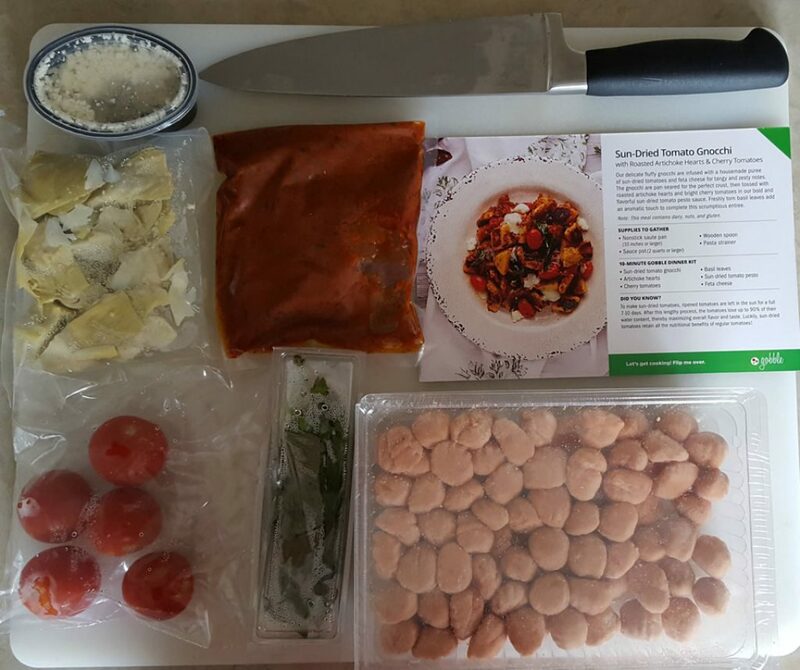 Preparation was easy with Gobble’s Gnocchi dish. 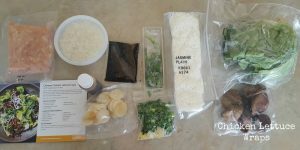 The only thing I had to actually prepare was pulling basil leaves from the stems – everything else is already cut and ready to cook with Gobble. Like most dishes with Gobble, there isn’t much you do. 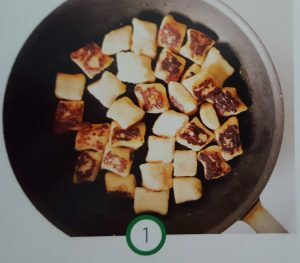 Instead, you just add things from the 10-minute kit to the pan. I did, however, notice that the cooking time was off for the gnocchi. I followed it, but mine turned out soggy. 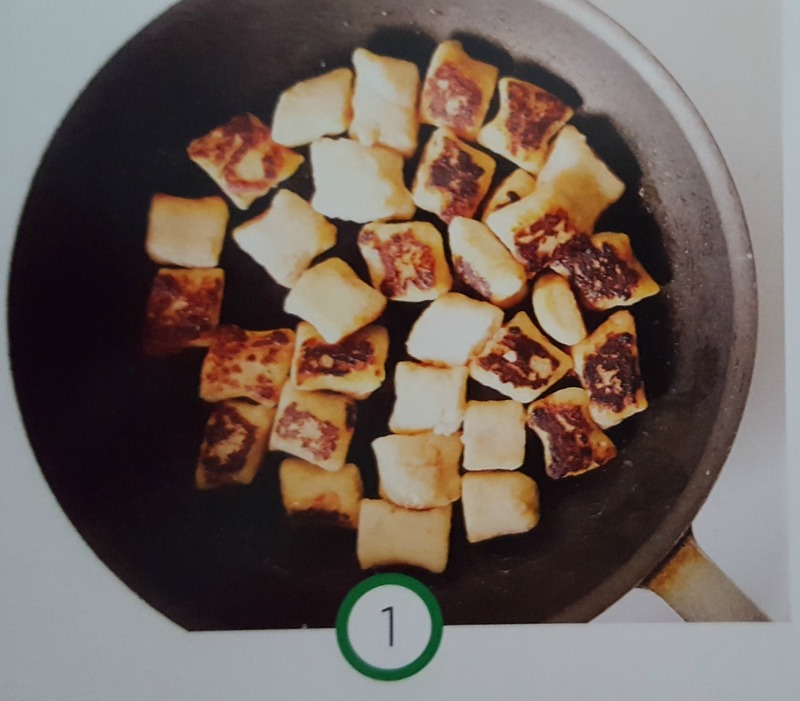 If you look at the recipe card, you’ll notice their gnocchi in the picture is white and squared, while mine was red and round. The flavor was OK with the gnocchi, but nothing that knocked my socks off. The sauce was premade and you just pour it when the gnocchi and everything is finished. 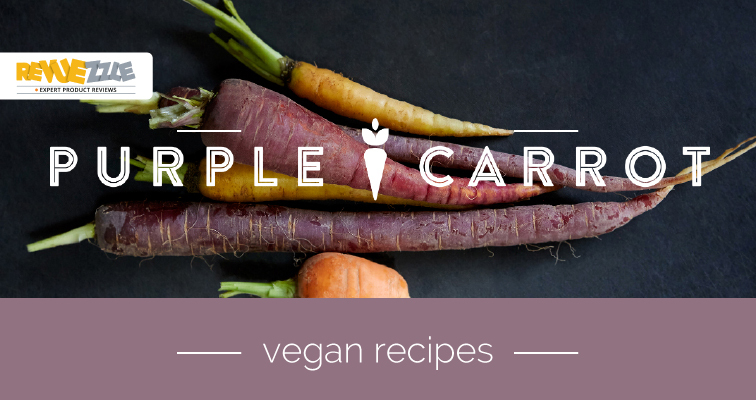 It wasn’t as thick as it looked on the recipe card either – it was much more watery. 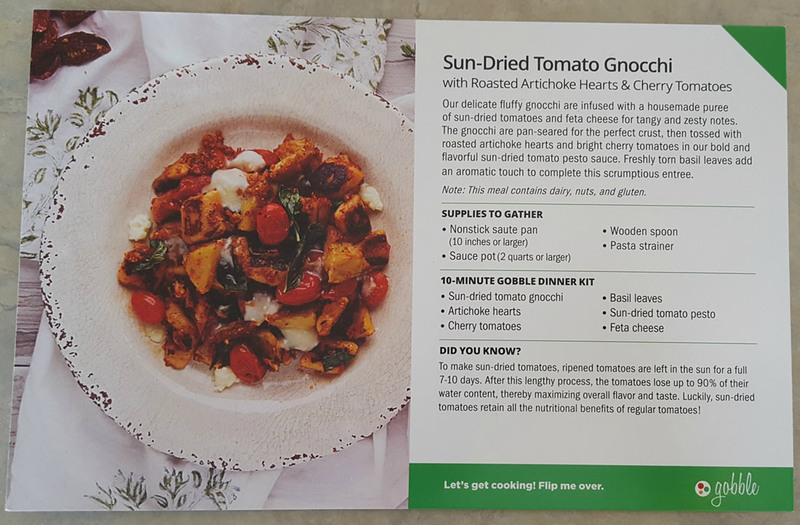 In the photo, you have small, bite-size cherry tomatoes. In mine, the cherry tomatoes were huge – and definitely not bite-size for anyone. 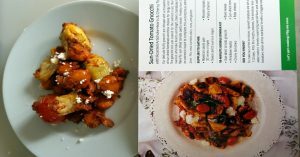 Also, you had large chunks of feta cheese in the gnocchi picture, but in reality, the feta was small sprinkles. Lastly, the final product didn’t look anything like the picture. I would definitely eat gnocchi again, but I probably would not pay to eat Gobble’s again. At $11.95 to $13+ per serving, it definitely did not have the flavor or appeal I would expect for the price tag. I got to pick my meals with Gobble and I selected this meal because it looked very summer-like. 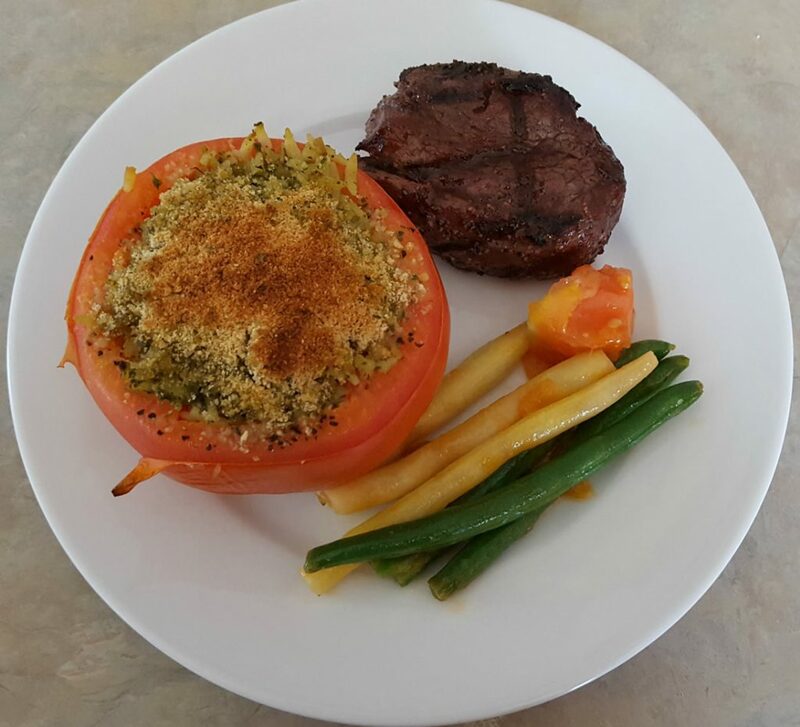 With fresh green beans, a big steak and a crispy stuffed tomato, I was definitely excited. As with other recipes, there was little preparation. All I had to do was cut the top off the tomato and pull out the insides. It should be noted, however, that I should have had two large tomatoes and I only was given one – so one plate didn’t get a tomato. Also, one filet package leaked in transit and wasn’t placed on the ice packs; therefore, it was warm and unusable (and obviously discarded). So, I basically only made one dish. Everything was already made for this dish – including the pesto and orzo. 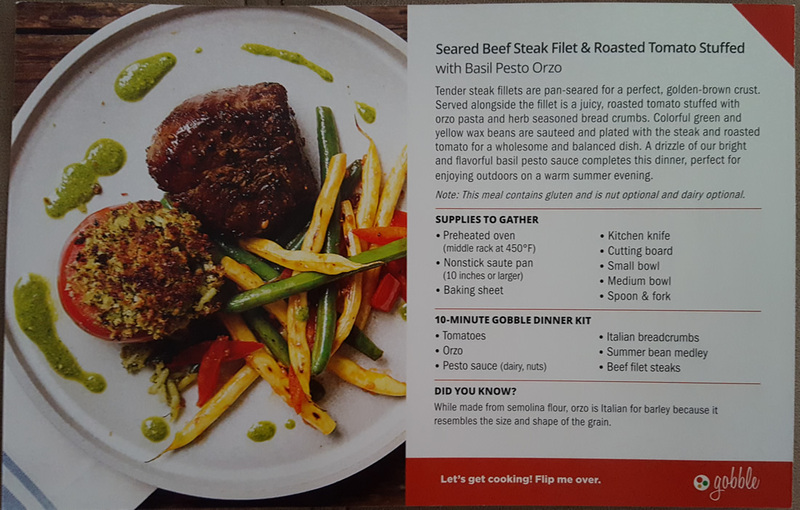 The recipe was spot on, and they even gave me minute breakdowns for the steak for medium-rare, medium, medium-well and well done. 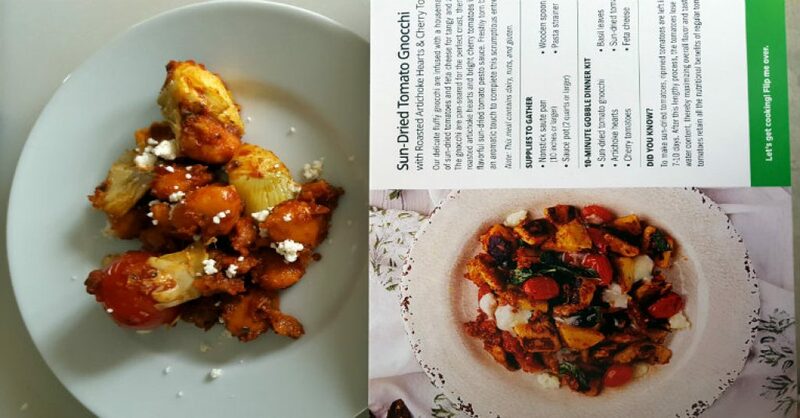 The dish didn’t come out looking like the one in the picture. For starters, the filet was way smaller than the picture and the tomato was huge compared to the steak. The filet was a great cut of meat though – so it wasn’t like I needed a hefty filet on my plate. The orzo and pesto had great flavor and it offset the blandness of the tomato. I think if the tomato was smaller, it would have not overwhelmed the pesto as much. As for the green beans, I found it odd that during cooking you didn’t salt, pepper or anything. You just added them to the pan with some olive oil and reserved tomato pieces and cooked. So, as I expected, the green beans were lacking serious flavor – salt might have helped. While I loved stuffed tomatoes and filet, I definitely think the beans needed something. I most likely would not repeat this dish for the price. I love lettuce wraps (cups)! Seriously, you will find me at an Asian restaurant scouring their menu for lettuce wrapped something. So, I was extremely excited to try this one out. This one had a few prep steps – which was unusual for Gobble, but it didn’t take longer than the 10 minutes to complete. Really, the only prep was washing and preparing the bibb lettuce, which can take a while. 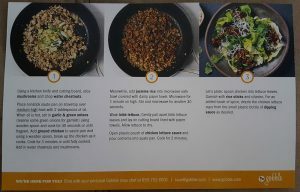 Bibb lettuce is inherently dirty – not Gobble’s fault. With all of the ingredients, it was surprising how quickly this dish came together. Even with washing and preparing the lettuce (which I did while my meat was cooking), it all came together in about 11 minutes. This dish came out exactly like the picture. 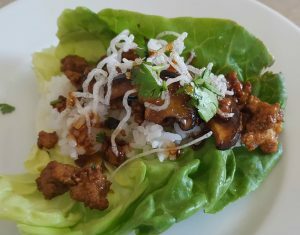 The bibb lettuce was the perfect size to create individual lettuce wraps, the meat cooked perfectly (I love ground chicken), and the sauce was quite tasty. Honestly, I have no taste complaints with this dish what-so-ever. Looks-wise, the dish looked as appetizing in person as it did online and on the recipe card. 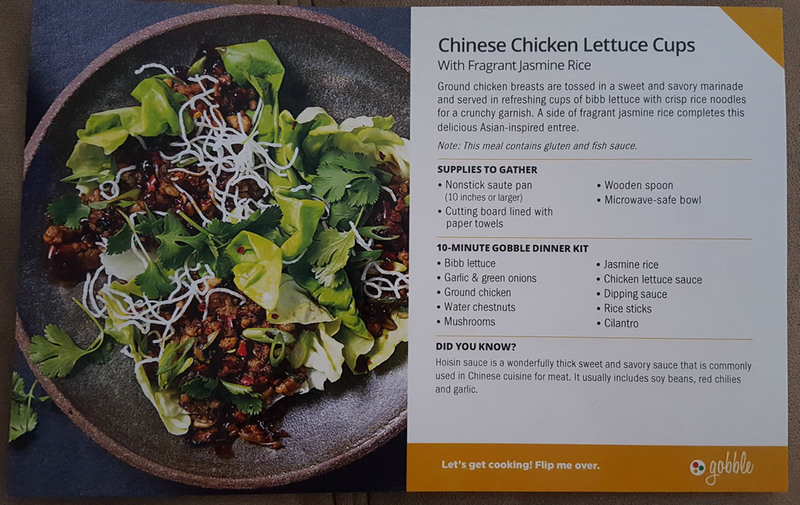 The hoisin sauce was not overpowering, the crunch from the rice noodles kept the dish from feeling like a soggy mess, and overall the filling was the perfect balance of spice and freshness. 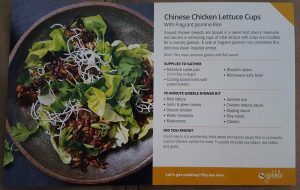 Yes, I would definitely eat Gobble’s lettuce wraps again. 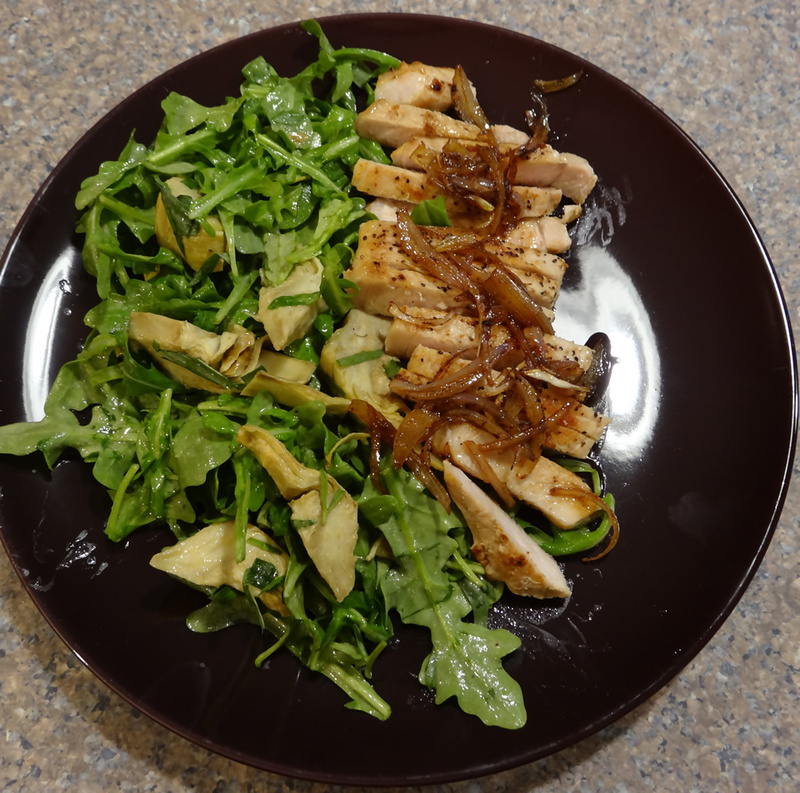 They were tasty, quick and easy to prepare and definitely worth the per serving price. 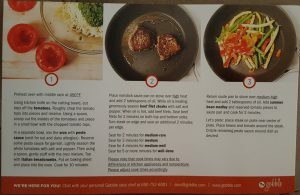 Gobble has an excellent concept and I know they are a growing company. 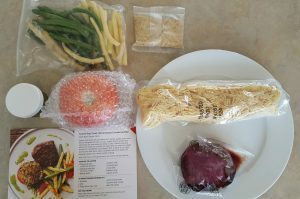 I may have had the unfortunate luck of picking three recipes that just were not the best pickings of Gobble – and they may surprise me in the future. Perhaps if they did not charge as much per serving I would not have been as hard on them. 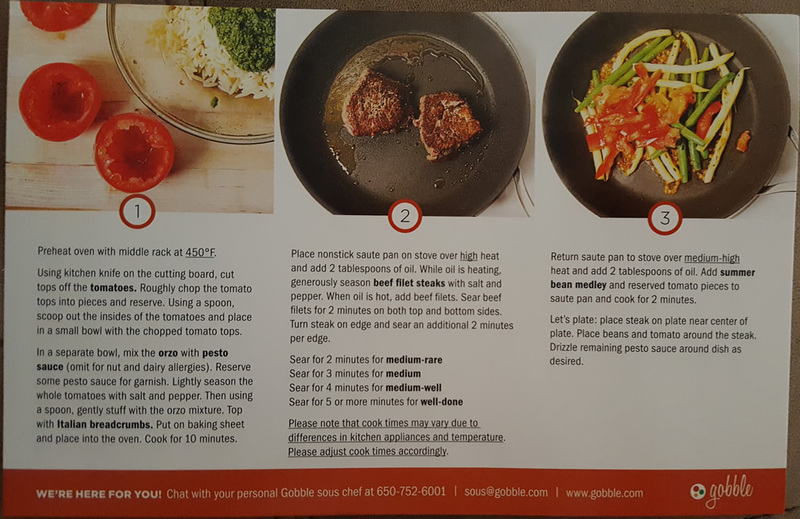 But, it should be noted that Gobble does live up to their 10-minute, one-pan rule. 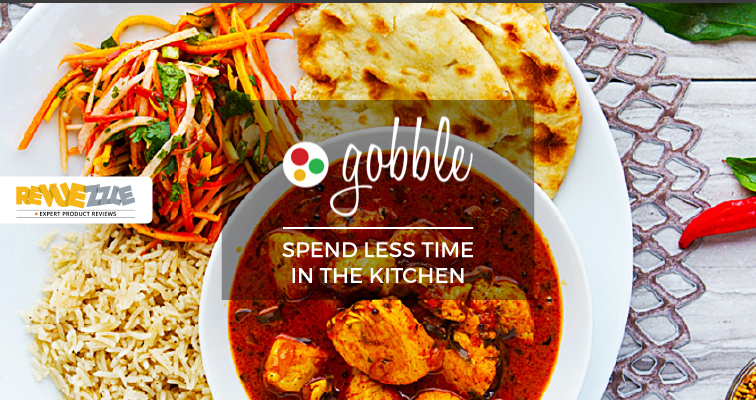 Every single meal I created was done in 10 minutes and I didn’t have massive cleanup like I did with other companies – so kudos to Gobble for that. Because there’s nothing worse than making dinner only to see the pile and chaos of dishes in the kitchen to tackle after. Read our in-depth review of Gobble on Revuezzle. 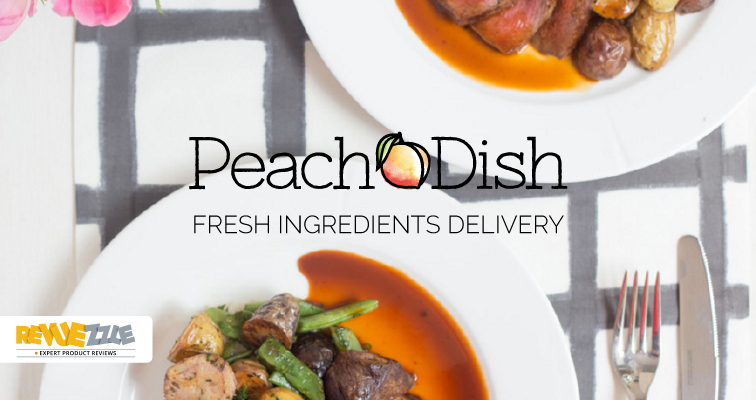 Don't forget to check out all of our reviews of meal kit delivery services so you can pick the one that is just right for your cravings!